Devi Bhava darshan at Chennai had ended well after sun-up, so it was a hot and dusty ride to the Bhavani River. After dark, Mother seated Herself on a small raised circle of cement and grass. The location was special, with a number of temples and shrines here and there. They rose like stone trapezoids pale against the darkening sky, their surfaces covered, in the traditional South Indian style, by carved forms of gods and goddesses, demigods and flowers, mythical beasts and geometric forms. If you let your gaze glide upwards from Mother’s Face, you saw a blue-skinned flute-playing Krishna; he sat with one leg crossed over the other, actually some distance away and high on the temple face, but the juxtaposition of his form and Mother’s was a special delight. Again it was bhajan time, and Mother, accompanied by Swamiji’s harmonium, led the group in both old, familiar Malayalam bhajans and the newer Tamil ones. Suddenly there was a squeaking sound – Mother looked up to Her right, and all eyes followed: a pair of white owls sat on an electrical wire, adding their voices to the bhajans, fluttering now here, now there, always together. A bit later in the evening, Mother called out to one of the brahmacharis to dance while She sang, and there, on the circle of concrete, he did so, amidst cheers and laughter as his movements grew wilder and more exuberant. Next She called on one of the western women to dance, “Sing and dance,” She directed, and that’s just what the woman did. More laughter and applause, and admiration at the simple innocence of these two who would do anything – even perhaps look foolish – to delight Mother. The group stayed at the Bhavani that night, leaving for Trissur only late the next morning, having shared the traditional breakfast for that location: Bhavani Kanni. The story goes that one year when the group stopped at the river, there was enough rice for kanni, but not enough of one kind of lentils for the curry. Two different lentils were mixed, and a new dish created. Since then, not only at the Bhavani itself but often also on the day of departure for a tour, this special dish is served. A family tradition, one could almost say. 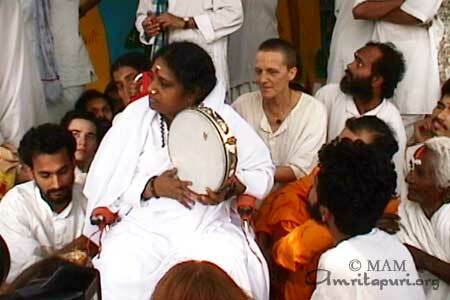 Travel with Amma is like that: a mixture of traditions and novelty; the familiar and the unexpected. Perhaps that is why, despite the rigours, Mother’s tour groups keep on growing bigger, year after year.